President Donald Trump visits Section 60 at Arlington National Cemetery in Arlington, Va., Saturday, Dec. 15, 2018, during Wreaths Across America Day. President Donald Trump made an unannounced visit to Arlington National Cemetery on Saturday to honor America’s fallen as thousands across the country laid wreaths on veterans’ graves. Trump paid his respects as volunteers for ‘Wreaths Across America‘ waited in long lines to place a Christmas wreath on the tombs of America’s greatest heroes. The event, which is held every December, aims to “remember, honor, and teach” about those who served, and perished, fighting for America’s freedom. In addition to Arlington National Cemetery, Wreaths Across America Day is observed at more than 1,400 cemeteries in all 50 states, as well as at sea and abroad. The president made the surprise visit to the military cemetery roughly an hour after the wreath-laying event began. 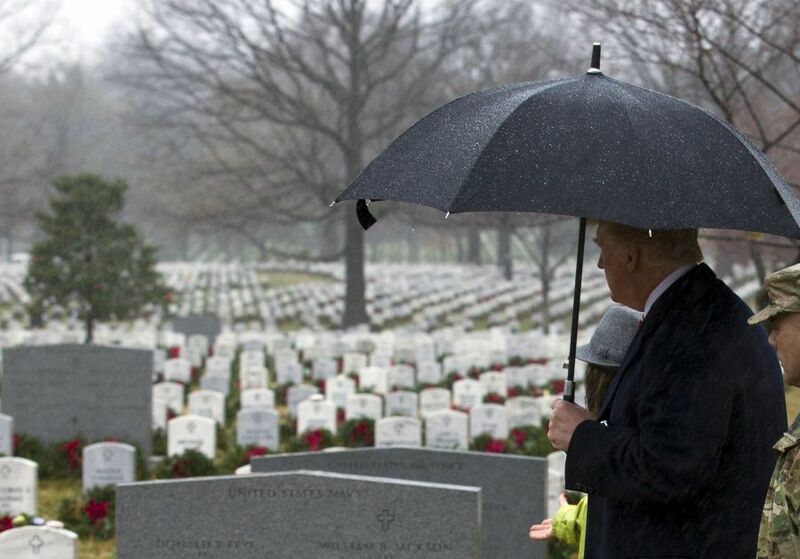 He walked through the grounds and viewed firsthand, in the rain and wind, the tributes that were given to America’s veterans. Trump faced criticism in November for not attending a ceremony at Arlington National Cemetery on Veterans Day and later admitted that despite attending a memorial service for World War I soldiers in Paris, France the day earlier, he should have also gone to Arlington on the federal holiday. Trump praised Wreaths Across America organizers and the volunteers for their dedicated and honorable work in the gloomy weather.